With a maximum gross takeoff weight of 12,500 lbs, the de Havilland Canada DHC-6 Twin Otter is an example of the upper limit of the light aircraft category. A light aircraft is an aircraft that has a maximum gross takeoff weight of 12,500 lb (5,670 kg) or less. 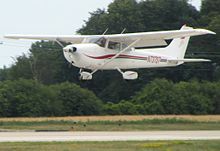 Many light aircraft are used commercially for passenger and freight transport, sightseeing, photography, and other similar roles as well as personal use. Examples of aircraft that are at the maximum gross takeoff weight for this category include the de Havilland Canada DHC-6 Twin Otter and Beechcraft B200 Super King Air. The many uses of light aircraft include aerial surveying, such as monitoring pipelines. They are also used for light cargo operations, such as "feeding" cargo hubs, as well as some passenger operations. Light aircraft are also used for marketing purposes, such as banner towing and skywriting. Primary flight instruction is also conducted in light aircraft. The majority of personal aircraft are light aircraft, the most popular in history being the Cessna 172, and most popular in modern history being the Cirrus SR22 and Robinson R44. Larger light aircraft, such as twin turboprops and very light jets are often used as business aircraft. ^ Viking Air. 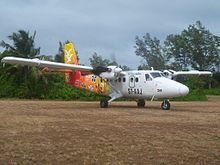 "Twin Otter Series 400". Retrieved 20 December 2016. ^ Jackson, Paul; Munson, Kenneth; Peacock, Lindsay. Jane's All the World's Aircraft. Jane's Information Group. ISBN 0-7106-2684-3. ^ Collins, Mike (August 6, 2009). "Piper project honors pipeline patrols". aopa.org. Aircraft Owners and Pilots Association. Retrieved 20 December 2016. ^ "Mountain Air Cargo". Retrieved December 30, 2012.